ABOUT: Woman in Gold is a 2015 British-American drama film directed by Simon Curtis and written by Alexi Kaye Campbell. The film stars Helen Mirren, Ryan Reynolds, Daniel Brühl, Katie Holmes, Tatiana Maslany, Max Irons, Charles Dance, Elizabeth McGovern, and Jonathan Pryce. The film is based on the true story of the late Maria Altmann, an elderly Holocaust survivor living in Los Angeles who, together with her young lawyer, E. Randol Schoenberg, fought the government of Austria for almost a decade to reclaim Gustav Klimt’s iconic painting of her aunt, Portrait of Adele Bloch-Bauer I, which was confiscated from her relatives by the Nazis in Vienna just prior to World War II. Altmann took her legal battle all the way to the Supreme Court of the United States, which ruled in her favor in Republic of Austria v. Altmann (2004). The film was screened in the Berlinale Special Galas section of the 65th Berlin International Film Festival. It is extremely important that we have this film. Sure the story has been told but really, not many people know it. Did you know that over 100,000 pieces of Art stolen by the Nazis still have not been returned to their current owners? I did not and I consider myself well informed. Is this a cinematic masterpiece? Hardly, but like some songs you don’t need to embellish the tune with vibrato – a pure, clean voice works best. The story here is intense and frankly, I do not believe that more drama would add to it. Daily Mail UK says, A decade ago, Maria Altmann drew international attention when she successfully sued the Austrian government to reclaim five family paintings that were stolen by the Nazis during World War II. And her triumphant story has now been given the big screen treatment, with Dame Helen Mirren portraying her, alongside Ryan Reynolds, who plays her attorney E. Randol Schoenberg. Plot: In the late 1990s, Maria Altmann (Mirren) runs a dress shop in Los Angeles. Sixty years earlier she fled her native Austria to escape Hitler’s persecution of the Jews. 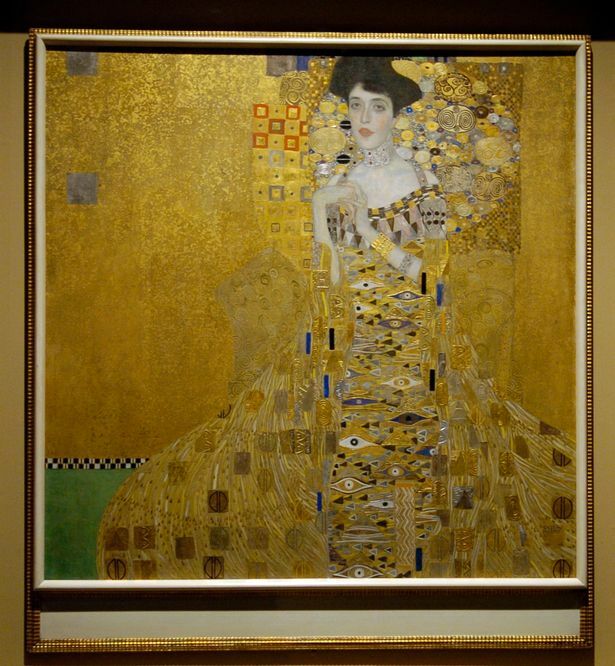 Now in her 80s, and upon the death of her sister, she hopes to wrest some of her family’s treasured paintings — including Gustav Klimt’s 1907, ‘Portrait of Adele Bloch-Bauer,’ also known as “Woman in Gold” — from an Austrian government that holds the works and won’t relinquish them. The Austrians revere the painting as “the Mona Lisa of Austria,” but to Maria it is a picture of the beautiful aunt she loved and lost. She retains a young lawyer, Randol Schoenberg (Ryan Reynolds), in the seemingly chimerical pursuit of recovering her family trove. If they succeed, any number of other masterpieces might legally be returned to the heirs of their rightful owners. Viennese lawyers did everything in their power to show Maria had no legal claim to their family treasures. Historical detail is important here and often what may seem fantastical simply is not. The director, Simon Curtis says; my family were all safely in the UK before WWII, so I don’t have a Holocaust story. But I feel culturally Jewish, and definitely identify with all of that… There’s a tension between authenticity … though what is authenticity? You just do your best. You research as much as possible. And in the case of this film, when the Nazi cars come in, we recreated an actual shot — when the Jews are painting on the wall — that was an actual photograph that you can find when you Google it, that we recreated. Reynolds is a weak actor but here he plays Schoenberg sympathetically. There are no nuances or layers but the story is not his and although Schoenberg was instrumental in getting the painting back, he is kind of a footnote [sorry] to the bigger picture. In Rotten Tomatoes Allan Hunter says, ‘The film is forgivably simplistic and sentimental but also stirring when it reminds us once again of the countless injustices from the Nazi era that can never be made right or forgotten.’ I would agree. I think that the story here is what counts most. ABOUT: Into the Woods is a 2014 American musical fantasy film produced by Walt Disney Pictures. It is directed by Rob Marshall, and adapted to the screen by James Lapine from his and Stephen Sondheim’s Tony Award–winning Broadway musical of the same name. It features an ensemble cast that includes Meryl Streep, Emily Blunt, James Corden, Anna Kendrick, Chris Pine, Tracey Ullman, Christine Baranski, Lilla Crawford, Daniel Huttlestone, Mackenzie Mauzy, Billy Magnussen, and Johnny Depp. Inspired by the Grimm Brothers’ fairy tales of ‘Little Red Riding Hood,’ ‘Cinderella,’ ‘Jack and the Beanstalk,’ and ‘Rapunzel,’ the film is a fantasy genre crossover centered on a childless couple, who set out to end a curse placed on them by a vengeful witch. PLOT: Set in an alternate world of various Grimm fairy tales, the film intertwines the plots of several Grimm fairy tales and follows them to explore the consequences of the characters’ wishes and quests. The main characters are taken from of ‘Little Red Riding Hood,’ ‘Cinderella,’ ‘Jack and the Beanstalk,’ and ‘Rapunzel,’ as well as several others. When a Baker and his Wife learn they’ve been cursed childless by a Witch, they must embark into the woods to find the objects required to break the spell and begin a family. The film is tied together to the original story of the baker and his wife, their interaction with the Witch who has placed a curse on them, and their interaction with other storybook characters during their journey. What begins as a lively irreverent fantasy musical eventually becomes a tale about responsibility, the problems and consequences that come from wishes, and the legacy that we leave our children. If you are like me, you kind of need to dismiss the absurdity of characters breaking into song and fairytales in general. Any bias I might have is left at the door in favour of a legitimate film review. I take my reviews seriously so I really make an effort not to cloud them. My opinions reflect the universe of the film and if that universe is a musical fairytale mashup – so be it. Are the actors talented? Sure. The cast includes Johnny Depp, Anna Kendrick, Meryl Streep, MacKenzie Mauzy, Christine Baranski, Tracey Ullman, Lilla Crawford, James Corden, Chris Pine, Billy Magnussen, and Emily Blunt. There is a huge problem with consistancy though. Given that this is a mashup, I would expect certain anomalies but the inconsistencies are flaws not anomalies. It is fun to see characters from different stories interacting and the emphasis, like the extremely popular animated film ‘Frozen,’ is child empowerment – commendable but unfortunately, I see the flaws. The acting is what counts, and different characters call for different ranges. Bustle.com agrees that Johnny Depp is fine as the Big Bad Wolf but his voice is the weakest of the cast. MacKenzie Mauzy plays Rapunzel but her singing is very limited. Christine Baranski as The Wicked Stepmother is fabulous in that role but her singing just isn’t memorable. Tracey Ullman as Jack’s Mother is great and so is her voice. Anna Kendrick is so wonderful here I almost forgot she was Cinderella [a compliment]. Lilla Crawford plays Little Red Riding Hood. She played Annie on Broadway and although she is talented, she needs to sing in many different roles because she is recreating Annie here. James Corden is a butcher and is very good here. Chris Pine plays the Prince mockingly. I wish the entire cast did this. Meryl Streep as the Witch is better suited to this role than her role in Mama Mia. I do not imagine that she will get any awards here but you never know. Billy Magnussen as Rapunzel’s Prince is better than Chris Pine. Sorry. Emily Blunt as the Butcher’s Wife is good but her aspirations are limited to having a child… Daniel Huddlestone as Jack [and the Beanstock] was amazing. I am disbelieving that I am going to say that many of the themes here are relevant – especially child empowerment, strong female characters and less than ideal, fairy-tale happy endings… Common Sense Media says, A lascivious wolf preys on a young girl, children lose and are separated from their parents, sympathetic characters die, handsome princes aren’t all they appear to be, and there’s no promise of happy ending for anyone. Mashups are a popular contemporary stylistic device and lately there is a flurry of musical film. Cinderella sings to Little Red Riding Hood near the end, “Witches can be right/Giants can be good/You decide what’s right/You decide what’s good.” The emphasis is not a black and white definition of certain roles. It would be a mistake to view this film as ‘feminist’ though. It’s absolutely not. Most of the female characters are 1 dimensional and most of the feminine quests involve youth, beauty, marriage, children etc. I did like this film and would recommend it for children and their parents. Colleen Atwood is nominated for costume design.